I need to know more about the ammo, recoil spring weight, and your mainspring setup. Recoil spring is Marvel 9#. Mainspring is Ed Brown competition, which is 19#. 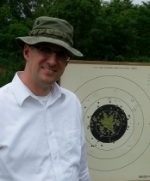 I've tried cci standard velocity, federal auto match, eley target, and sk pistol matxh. Have you switched all of the mainspring intenals to GI? Yes sir, the mainspring housing, and all internals, were replaced with Ed brown. I know CCI SV works decent in mine. I have better luck with the GSG mags. I never load more than 5 rounds in the magazine at a time. I never use the slide stop to chamber the first round, I always pull the slide all the way back then let it slingshot the first round in. I use 19# ISMI mainsprings or WOLFF 18# mainsprings. Are you sure the Ed Brown mainspring is 19#? Is your 1st round chambering ok? Not sure if this applies. If the magazines are metal, measure the width at the back and front part of the mag lips. Open a millimeter at a time equally on both sides of lip in either the back or front depending upon if bullet is hitting high or low as it enters the barrel. Brownells lists the Ed brown mainspring as 19#. I'm assuming they are right, not that I'd be shocked if they weren't. We're did you find 8# springs? The marvel precision website only shows 9# & 10#. 1st round fails almost every time. Chip, 4 of the 6 mags I've tried are metal. I tuned the Colt Ace mags to the specs given by marvel; however, I will try the gradual opening you mention. I adjust the back if it's hitting high? Funny, the barrel has a ramp, but the nose never comes close to it. You have to call them to order the lighter springs. Their website really isn't that good. Do you load the mags by pulling the follower down by the button then dropping the rounds in on top of each other? Don't load them like a 1911. Try inserting the magazine with the slide closed, then slingshot the slide and let me know if it still fails the first round. Until you can get the setup to feed the first round, you won't get it to work. I've been shooting a Marvel Unit 1 for a couple of years using CCI Std or SK Magazine ammo. If you use metal GSG mags you cannot drop the slide with the slide stop, you must pull the slide back and let go. If you use the poly plastic mags that come with the Kimber .22 conversion or the Nelson conversion, the slide stop release works just fine. 1) Broken firing pin or firing pin spring? Check to see if the firing pin is protruding, that will keep the round from getting into position and nose dive. Open the slide and point the barrel down to see if the pin is loose. Gun will often still fire even if spring or pin is broken. 2) Is the extractor moving freely? ProMags have worked flawlessly for my Unit 1 but NOT with the EGW mag catch. Didn't the OP say it would not chamber??? all those mods have little effect on putting a round in, as another said you must pull the slide back and try sling shoting the round in. To be brutally honest the best advise to getting something totally reliable is to send it back if possible or try another lower or sell it and buy a nelson. The old marvels are finicky, that's why nelsons are taking over, they work. At work now, but I'll try some of the recommendations when I get home. Would the recoil spring weight affect the feed angle from the mag? Thank you for the help! DavidR must have been writing at the same time as me. The issue is definitely chamfering the rounds. 1st things 1st - - try an Advantage Arms conversion magazine - borrowed - or maybe from CMC Government Supply- or?. 2nd thing -Depending on your Marvel model- modify a CP shok buff so it'll just fit- not too tight/not too loose - between the frame and barrel mounting lug - it'll look like "U" - So you can run a light spring without battering the slide/frame. -- My buff hasn't moved, and shows almost no wear after thousands of rounds fired. ps-My Marvel is one of the originals. Years ago I sold 3 steel Marvel magazines for $25. If someone hadn't bought them, they'd have gone into the metal recycle bin. ---Try this: W/ pistol pointed in a safe direction - manually cycle 5 live rounds thru it with each magazine (the ones that work). Marvel steel mag: The rounds were beat up bad- dings, lead shaved off - terrible looking. AA magazine: Some, not all, rounds were slightly dinged. Some were not dinged at all. - But the AA mags are stone reliable. I would look to seek if the round is not rubbing against the extractor. The standard range officer mag catch should be ok. If the round is rubbing you may need a lower mag catch. I believe Dawson precision makes a low mag catch. Don't drop the slide to load the mag catch is not great for that it's gust designed to wedge the barrel in place. Is the slide installed snuggly? There should be no play on the slide. If there is open the action, engage he slide stop, and tighten the guide rod to a little past hand tight then back off a 1/16 of a turn. If the slide has play it won't feed and won't be accurate. If the guide rod is not staying fast try a little purple locktight the least permenent one blue is ok but purple is better for this application. Don't use red. I would tune them to run on gsg mags, I had the best luck with those. You can buy the three spring pack from marvel , maybe it has the wrong recoil spring. I have a couple AA mags coming. I'll see If they do any better. I don't think a lower mag catch would work. Alot of times the breech face runs over top of the mag. So it doesn't actually catch the round. I think lower would make it worse. The guide rod is definitely snug. I actually tried losening it a bit. Didn't help. I'll report back once the AA mags come. Thanks for the help! X3 on not using the slide stop. I was having a similar problem. Now I gradually pull back the slide and let it go from the rear. Zero issues thus far. Put some grip tape on the rear of the slide. CCI SV has been the most reliable. But now I use Tenex and it seems to run fine as long as I use a bore snake and brush every 20/30 rounds. I also drop the empty magazine before I lock back the slide. The magazine rides high, so this works better for me. Mine is mounted on a SA "Loaded" frame. I use the 8# recoil spring. I use the EGW higher magazine catch. Using the EGW mag catch raises the Colt mags into the ejector. I first bend the bottom of the magazine to allow the magazine to seat into the frame. It has to be slightly loose. I file/stone disassembled magazine until it clears the ejector. I adjust the feed lips. When I've finished the magazine will not contact the ejector, it feeds straighter into the chamber with minimal deformation of the bullet nose. It will load reliably from pressing the slidestop with slide already locked back, sling shotting a slide already locked back, or slide is forward and sling shotting. It works excellent! I cannot use GSG mags with EGW raised mag catch because they are not tunable. I have modified a ProMag .22 magazine to function reliably but it needs to be sling shotted because of the cartridge placement in the magazine; it is further to the rear and the bolt face won't pick it up unless pulled back to allow the round to pop up for pick up. Marvels run great when tuned like I described with Colt mag. Okay, finally got the AA mags. They didn't seem to be doing any better than any of the other mags. Feeling that I had nothing to lose, I opened the lips of the colt mag way more than anything I had read. Tried it, and seemed to work a bit better. Took the hd mag catch out and replaced with the stock. Now it seems to be working perfectly. Only time will tell, but we shall see. Thanks for the many suggestions. If you spread the feed lips the cartridge sits higher in the magazine. That's why it probably works better without the higher mag catch. In most cases when using higher mag catch the magazine will rub on the disconnecter rail as well as push the ejector up interferring with the slide travel. I was experiencing the slide not closing and found the shell moved fwd in the mag and the slide rubbed hard on the side of the bullet. Not sure quite why or how to fix it but is that part of your problem as well? Slide wasn't rubbing, rounds were just nose diving. I adjusted the mag lips according to a pdf I found from Wilson. This didn't fix the problem. Out of sheer frustration I opened the lips WAY wider than the marvel pdf recommended. Knock on wood, but since that, the conversion only had one alibi in 4 national match courses!